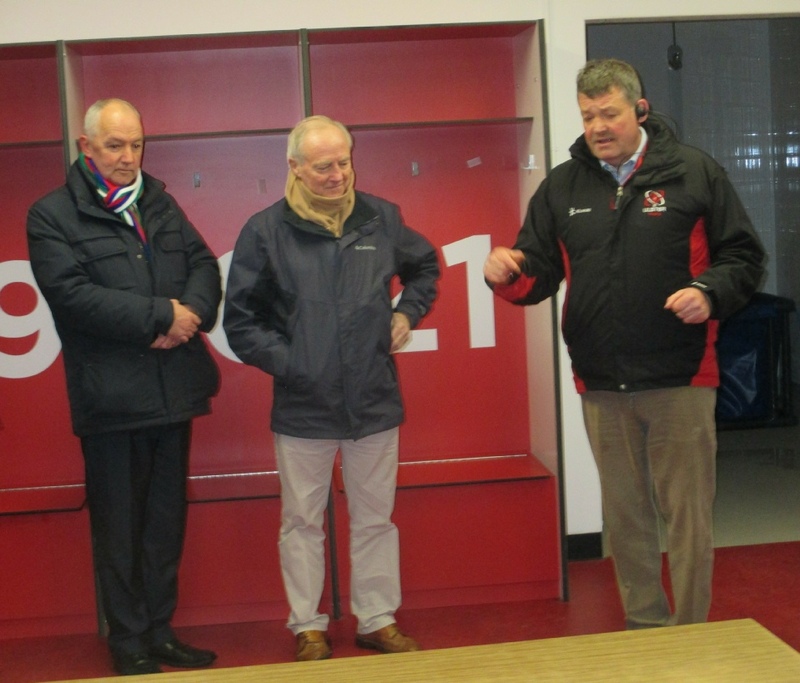 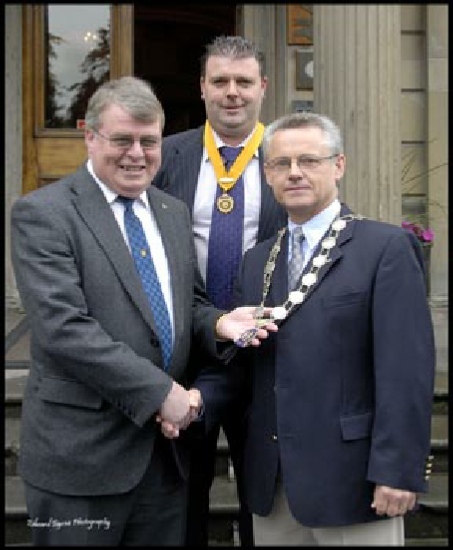 George McCaigue takes over the reins from John Dawson while the President-Elect James Dale looks on. 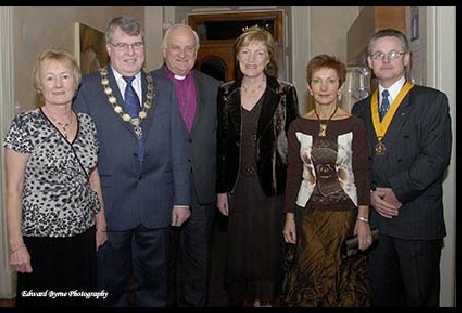 2006-07 President's Night with guest speaker Lord Eames, the recently retired Archbishop of Armagh and Primate of all Ireland. 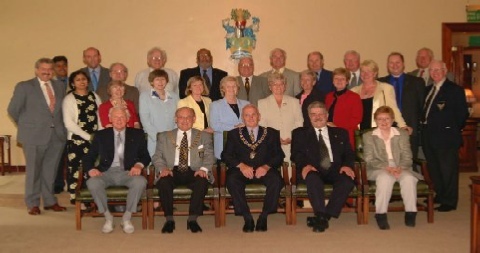 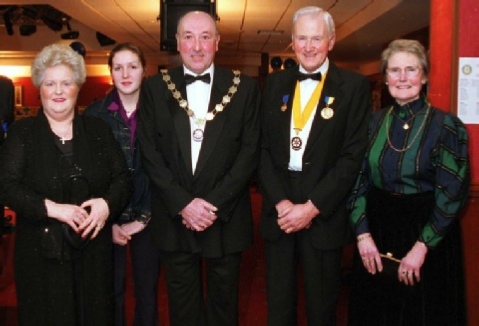 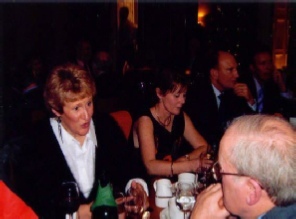 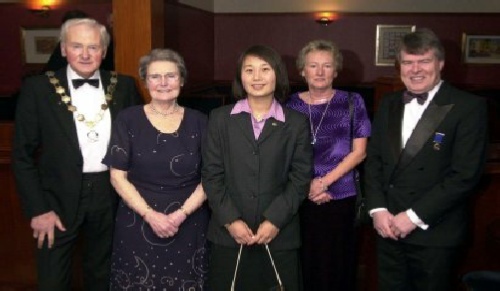 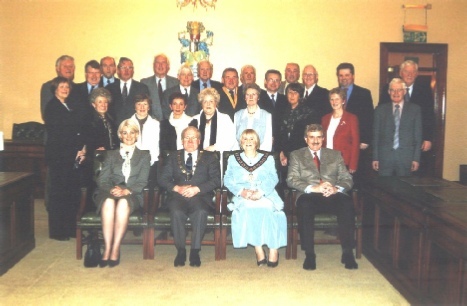 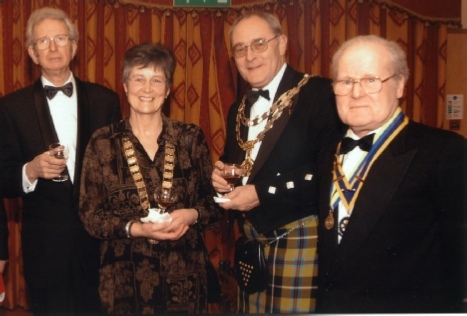 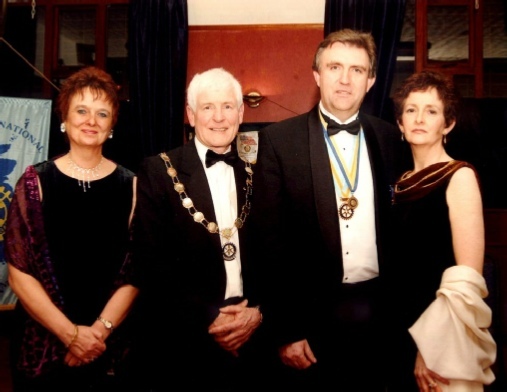 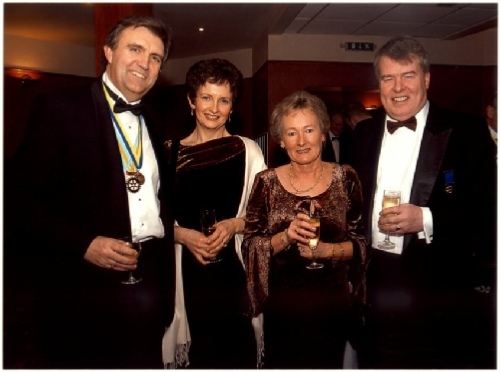 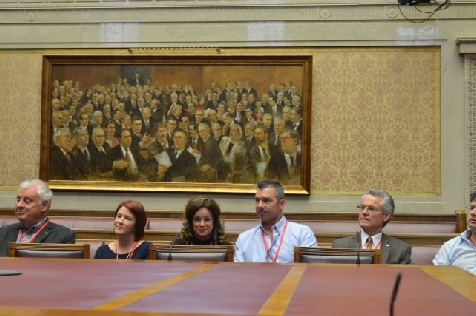 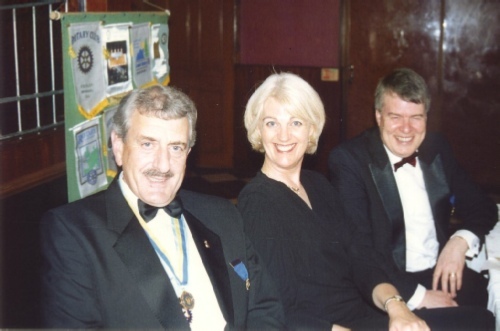 Left: Lord Eames in the centre wife lady Eames; to his right is President John Dawson with his wife Jenny and to his left Vice President George McCaigue and his wife Anne. 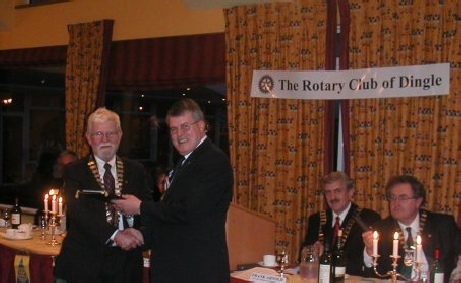 Vice President George McCaigue looks on as Past President Hugh Rice congratulates John Dawson on his second period as President. 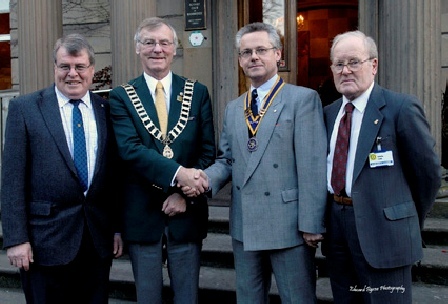 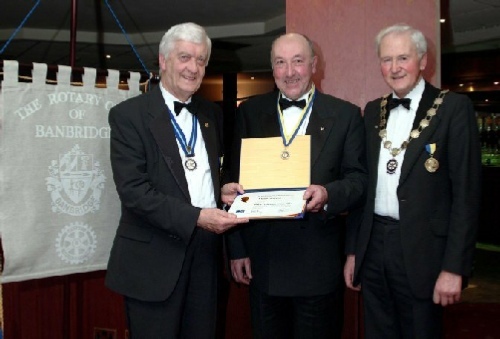 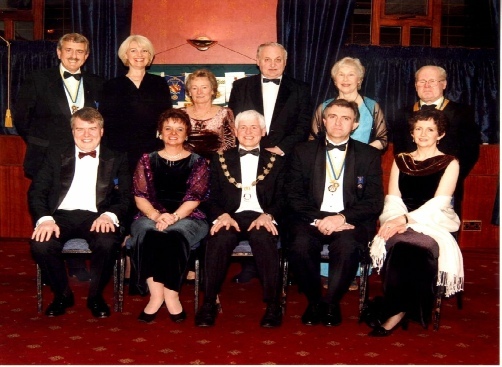 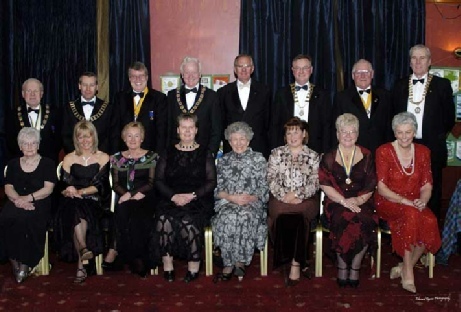 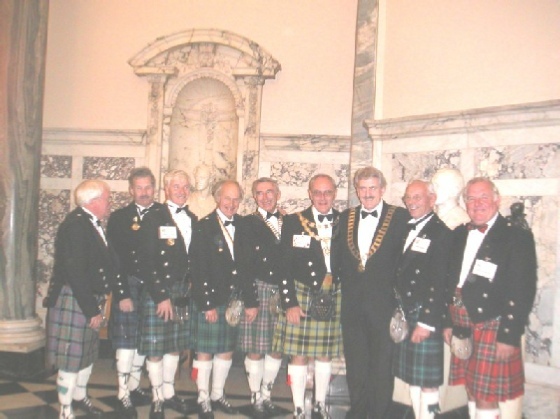 Main guests at the charter dinner (From left, standing, President Eddie Carr, District Governor Martin Molony, Vice President John Dawson, Chairman of Banbridge District Council Jim McElroy, Past President and Founder Member Ralph Bauer, President of the Rotary Club of Newry, Neil Tate, Vice President of the Rotary Club of Renfrew Eddie Williams, President of the Rotary Club of Navan, John Craig. 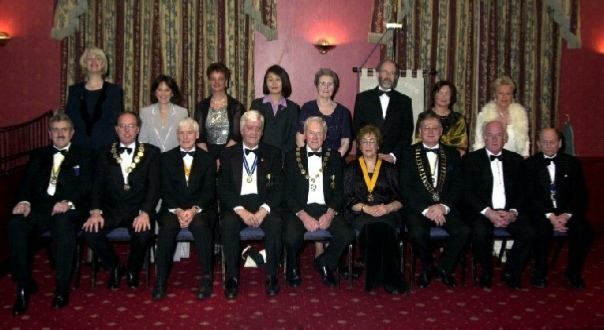 Partners seated from left, Alice Carr, Past President of the Rotary Club of Dublin Central, Alva Hope-Ross, Jenny Dawson, Evelyn McElroy, Ann Bauer, Sue Tate, June Williams, Kathleen Craig. 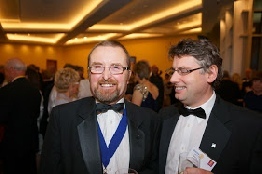 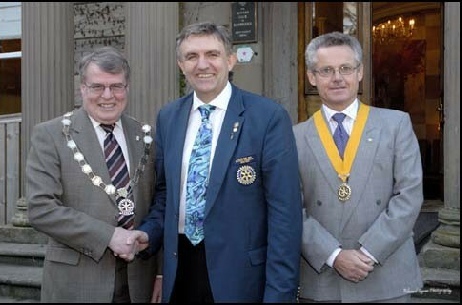 Eddie Carr (right) becomes President for the second time and is congratulated by outgoing President Robin Mowbray. 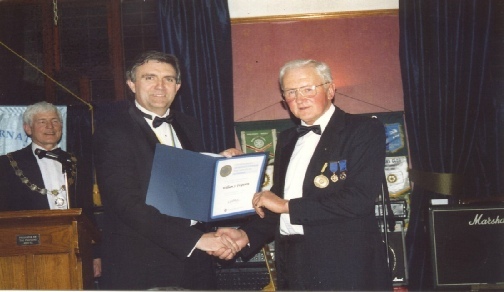 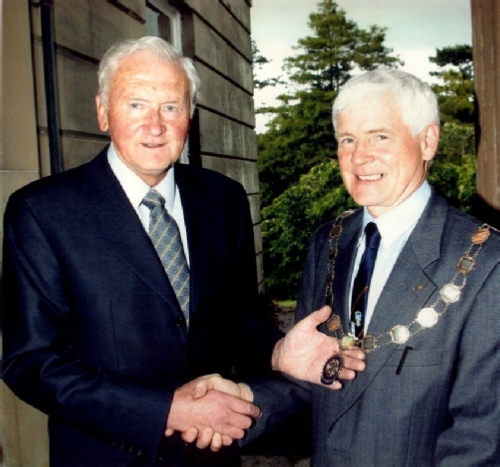 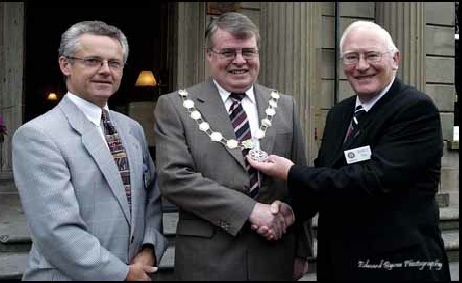 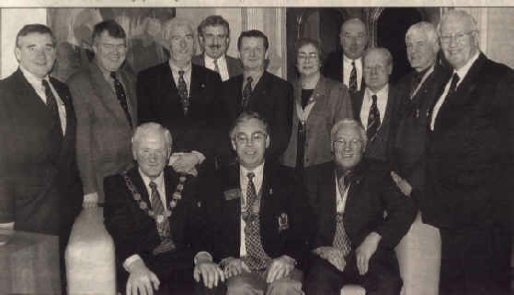 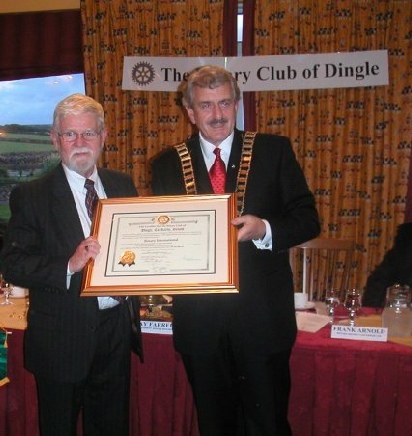 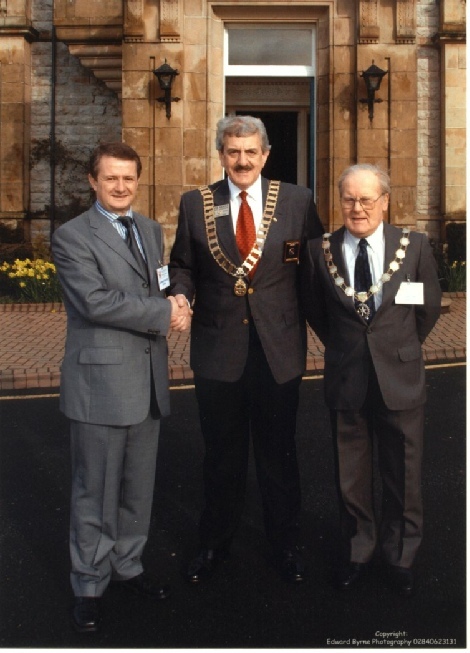 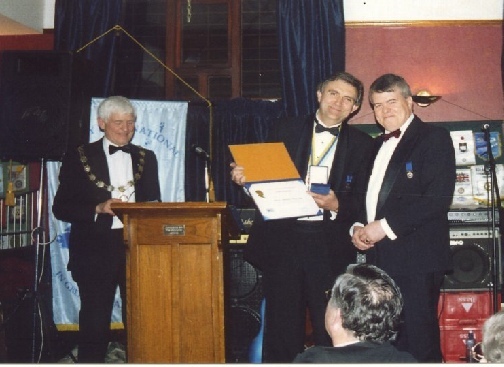 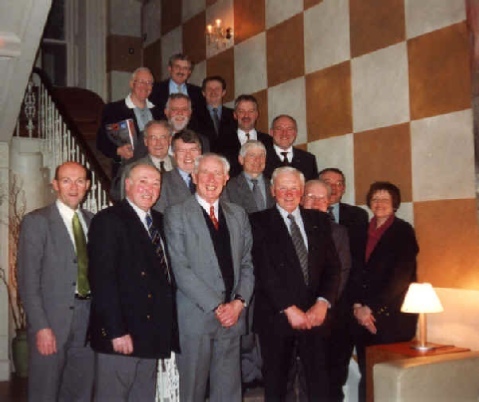 2003-04 - District Governor Frank charters a new Rotary Club in Dingle, County Kerry, and presents the Charter to Founder President Ray Farrell. 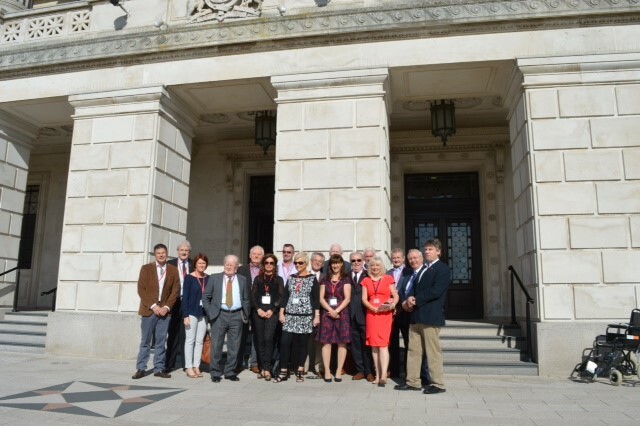 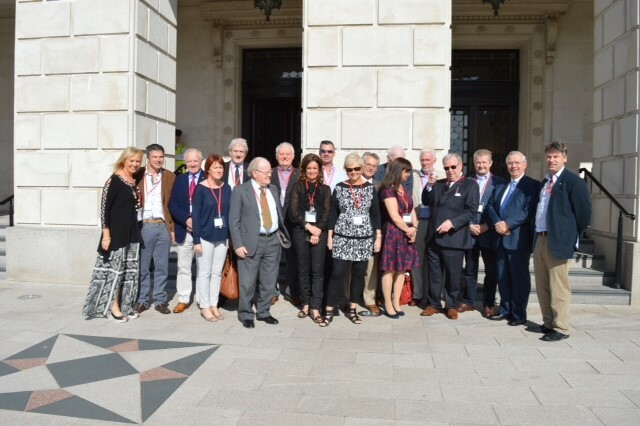 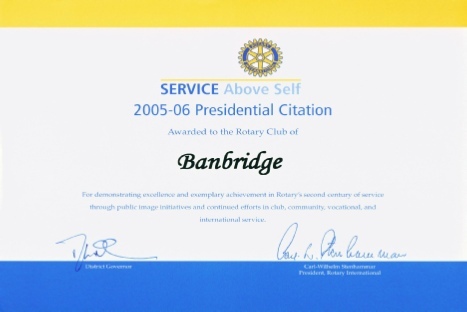 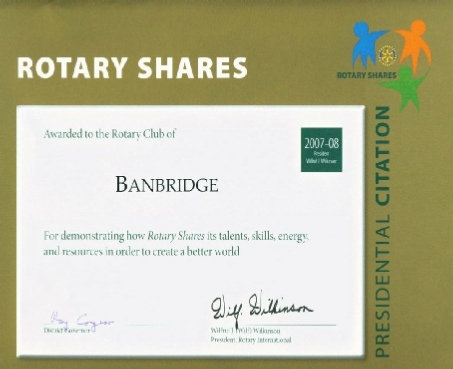 Banbridge Academy hosts the District Council Meeting, which is the quarterly meeting of Ireland's 74 Rotary clubs (April 03). 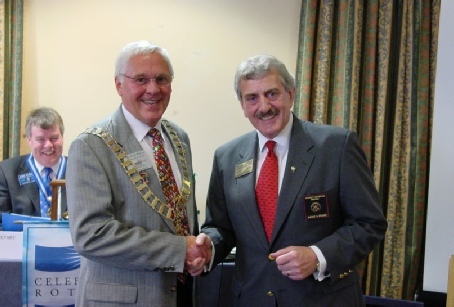 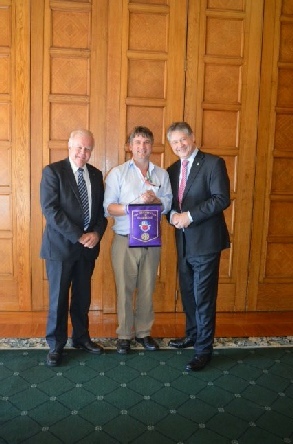 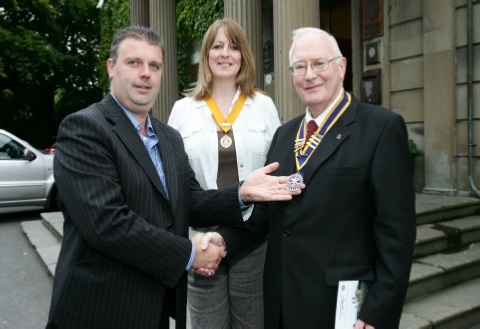 Immediate Past District Governor Frank Arnold hands over the reins of District 1160 to District Governor Crawford Wilson of the Rotary Club of Antrim. 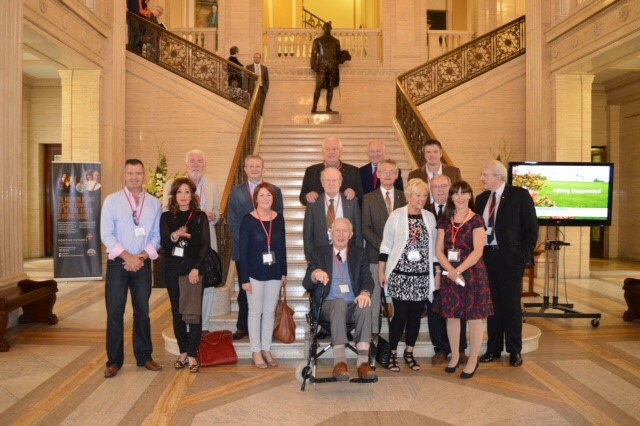 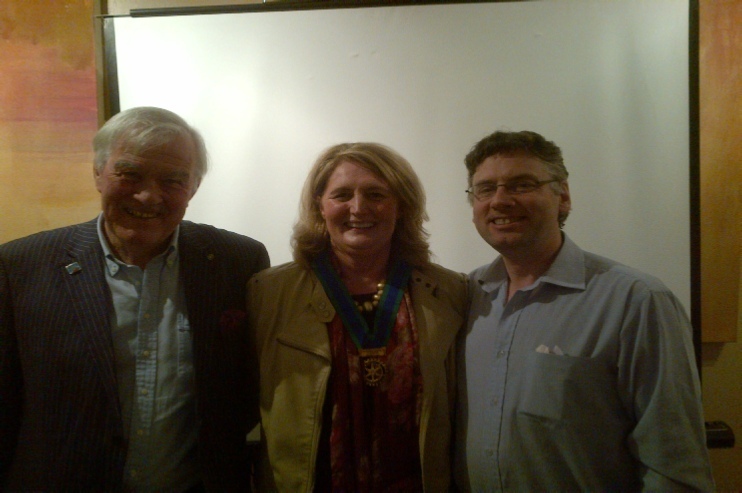 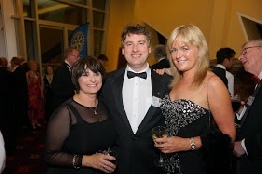 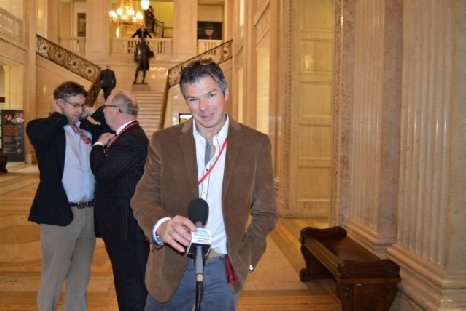 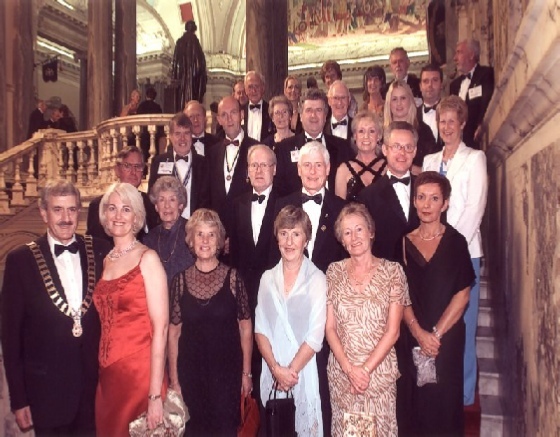 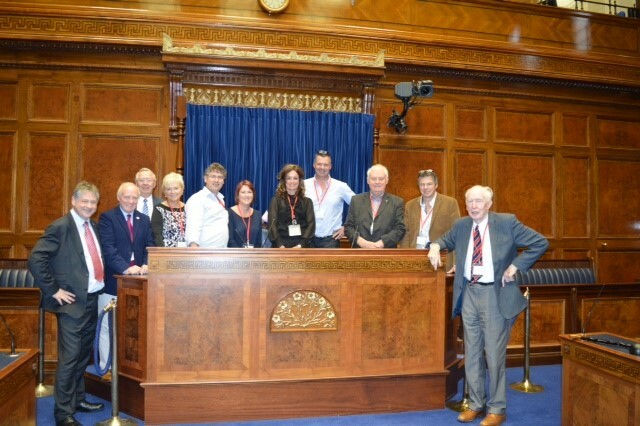 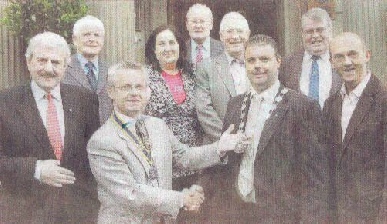 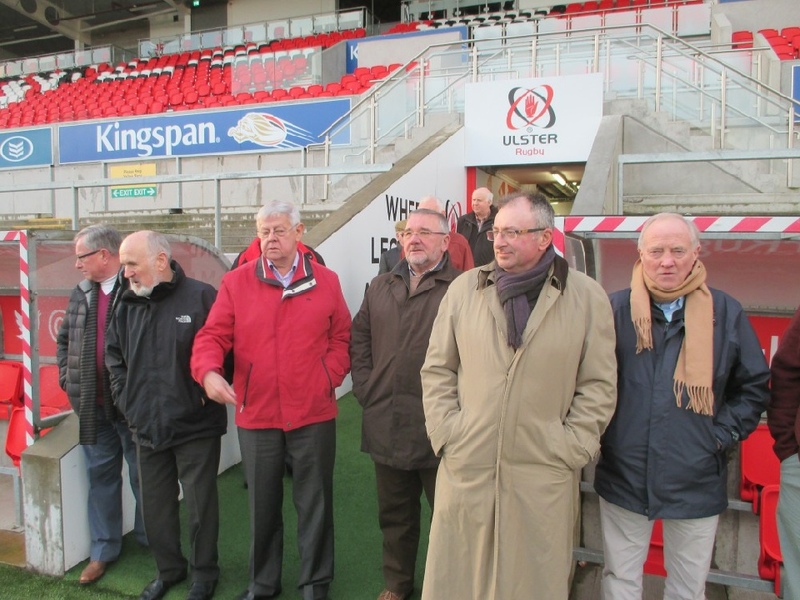 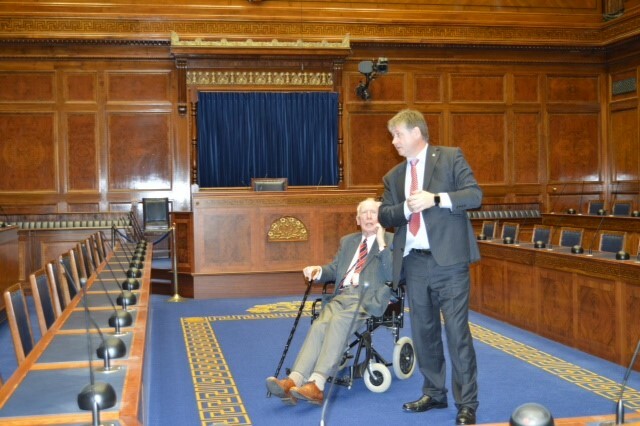 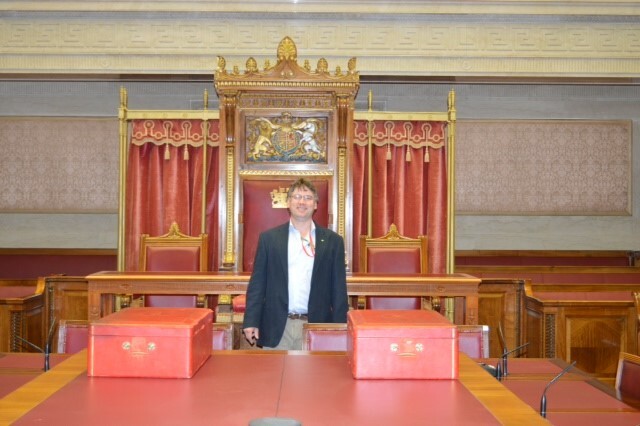 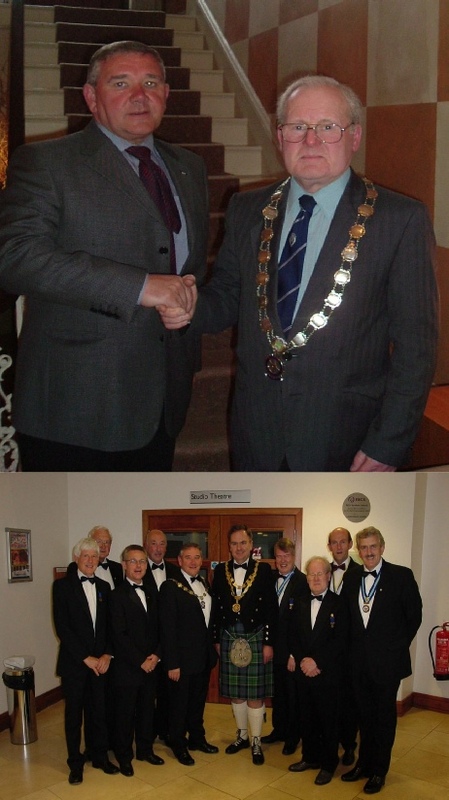 On February 10 we were guests of Banbridge District Council, and we had a wonderful evening of Fellowship. 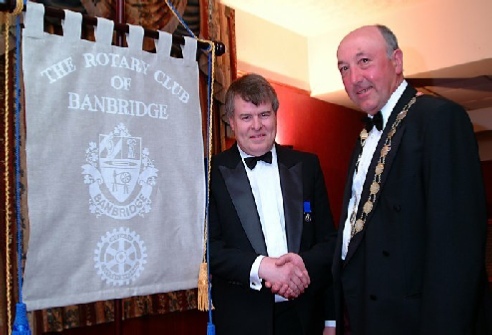 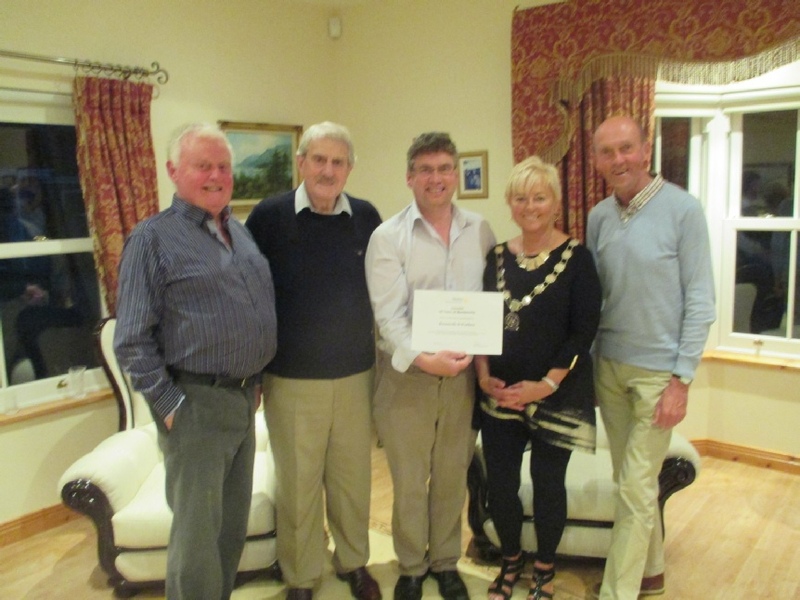 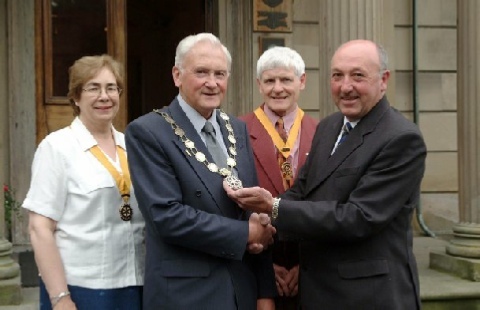 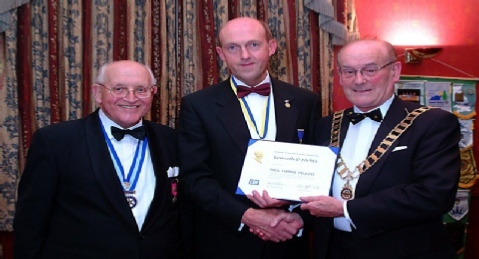 The occasion was a mark of respect from the Council to the Rotary Club, having provided the District Governor, Frank Arnold, this Rotary year. 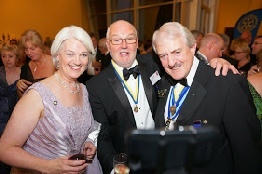 Past President Frank Arnold photographed with his wife Vianne. 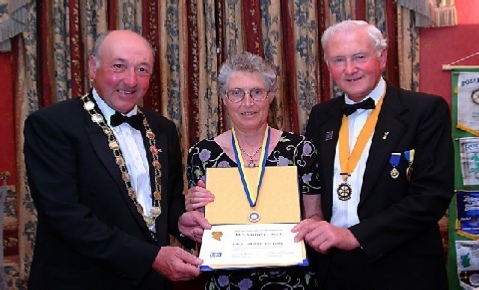 Frank served as our District Governor with Vianne as District 1160's First Lady. 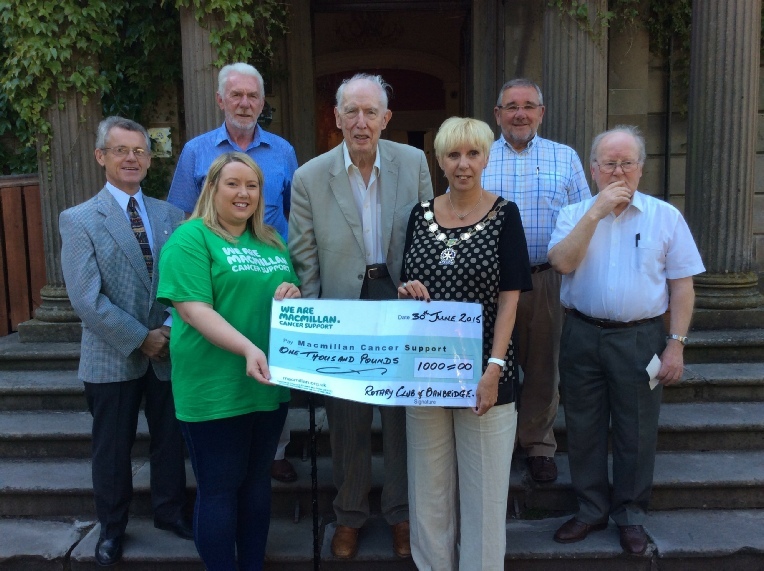 Past President Jenny Ervine rounded off her year in office with the presentation of cheques for £1000 to Emma Ewings from Macmillan Cancer Support and £200 to Emma Hamilton from Banbridge Gateway Club. 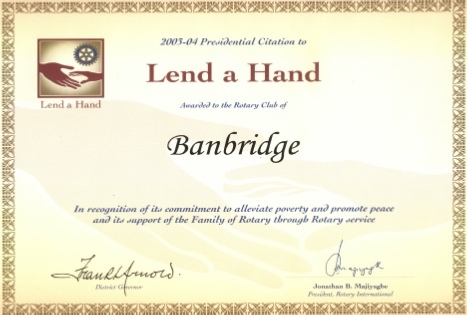 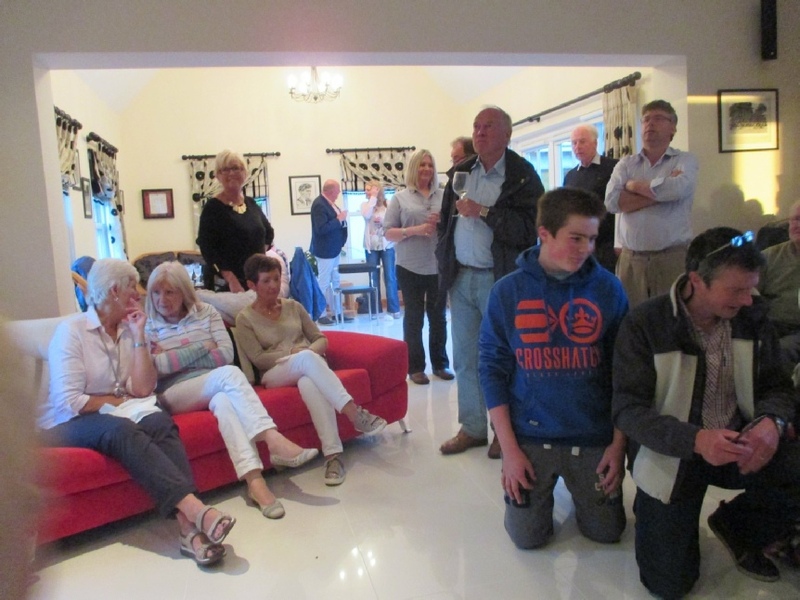 During 2014/15, a total of almost £5,000 was distributed amongst local and worldwide charities including Shelter Box for the earthquake in Nepal, Wind up Radios for Zimbawbe, Kiptulwa Primary School in Kenya, Upper Bann PIPS Suicide Charity and a donation to local man Jake Fisher to help with his volunteering work in Africa. 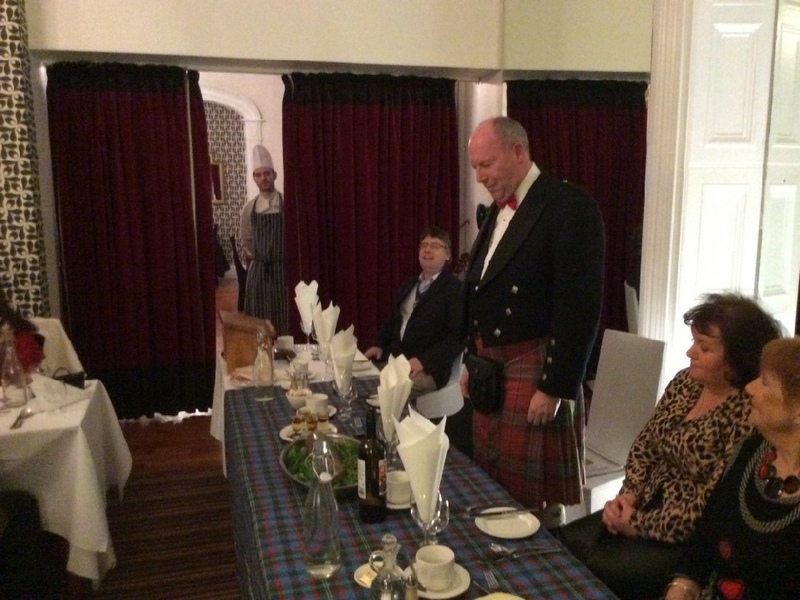 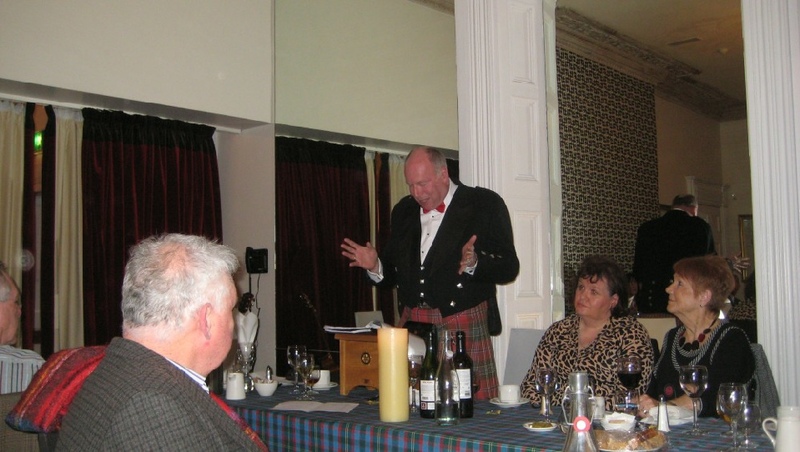 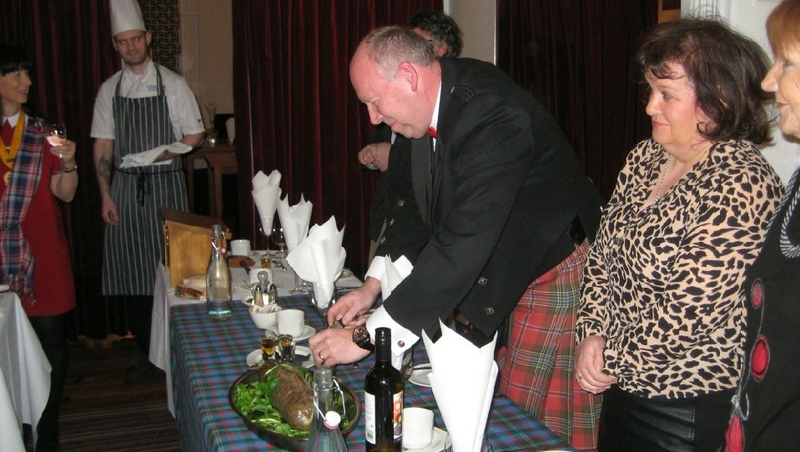 2016 Burns Night was celebrated in style. 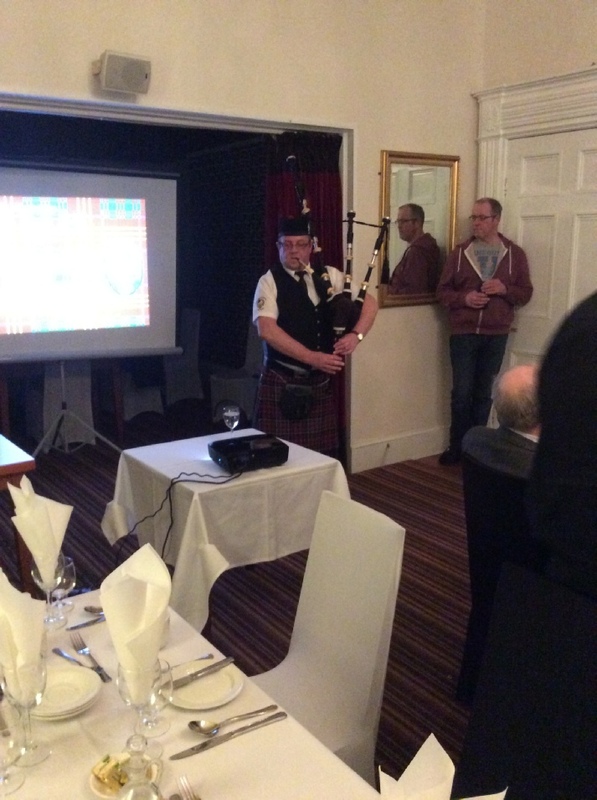 The guest speaker was Trevor Robinson, Vice Principal of Ballydown School Banbridge, and the piper was Ronnie McDonald of the McDonald Memorial Pipe Band. 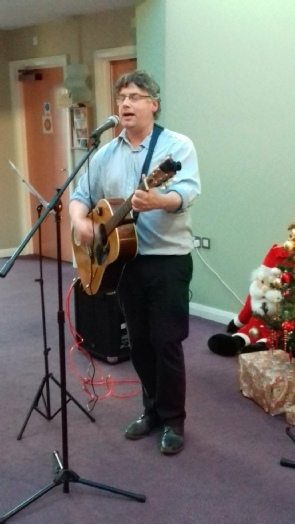 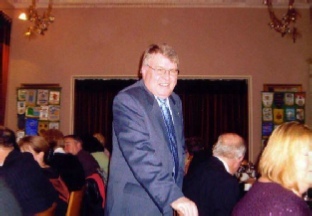 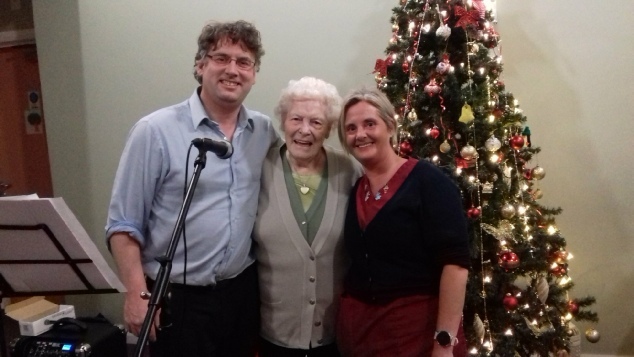 December 2018 - Past President Gerry McElvogue providing the entertainment for the residents of Spelga Mews, at a Christmas party hosted by the Rotary Club. 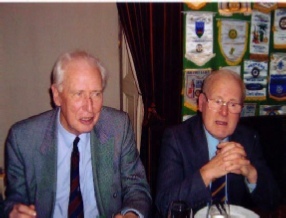 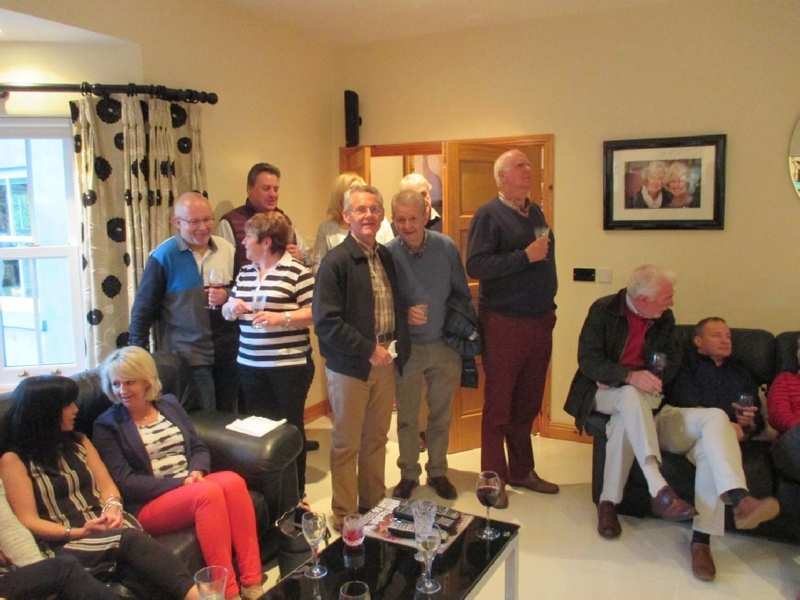 Here Gerry is pictured with a Spelga Mews resident and staff member at the same party. 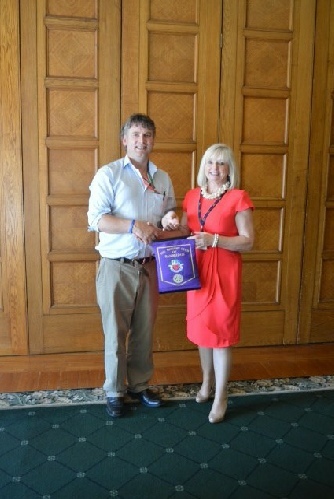 Outgoing President Gerry hands over to Lynda Shields. 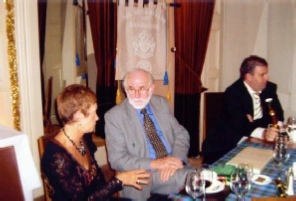 Looking on (from left are Nigel Jess, Frank Arnold and Ken Forbes. 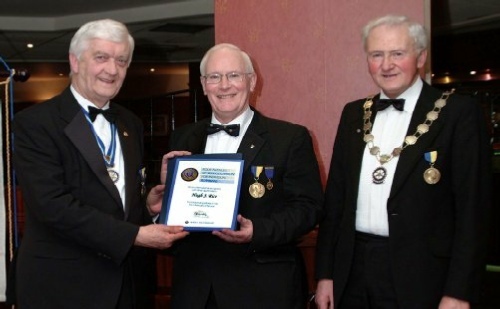 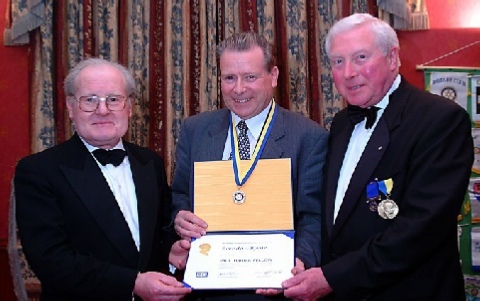 Nigel and Frank had been presented at Frank’s BBQ with 25-year service certificates from the Rotary President, and Ken received a 35-year service certificate. 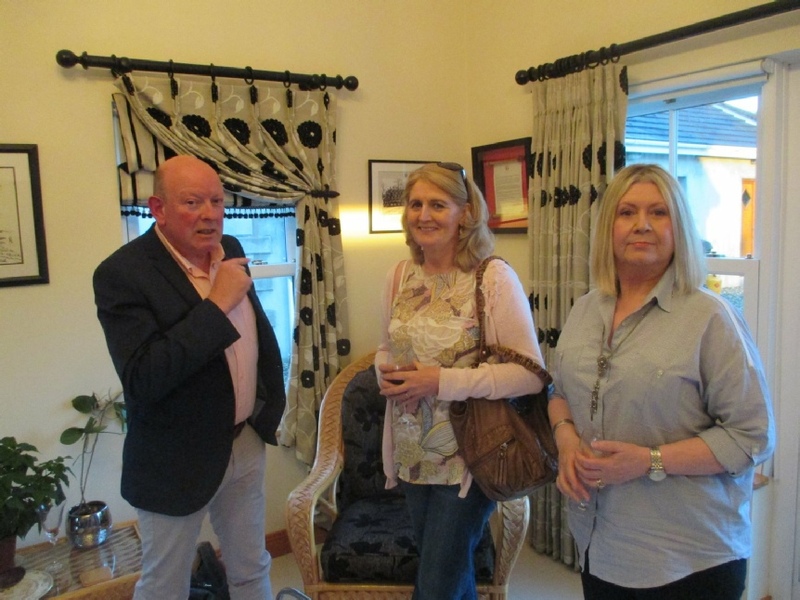 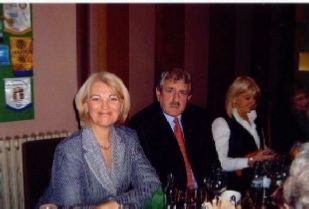 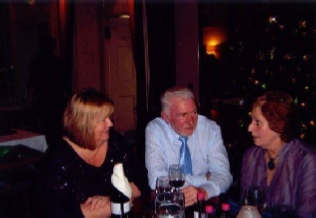 Looking on are 1st Vice President Mary Smyth and 2nd Vice President Louis Boyle. 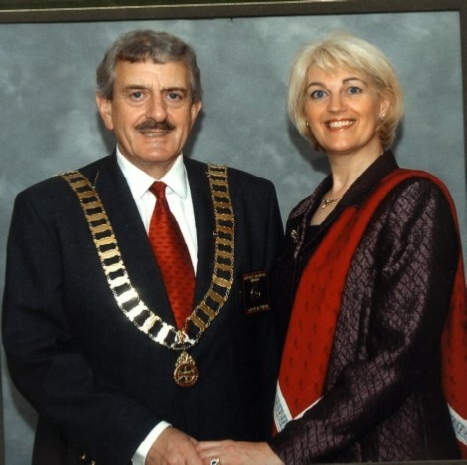 Unfortunately Mary has left the area following her marriage and she was not able to take on the role of President after all - our loss was Berkley's gain! 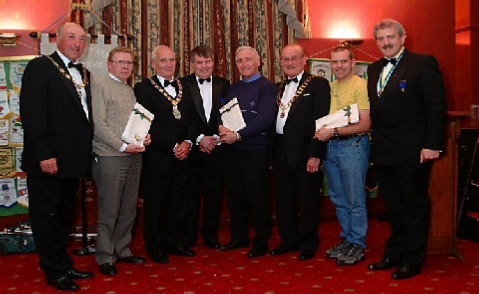 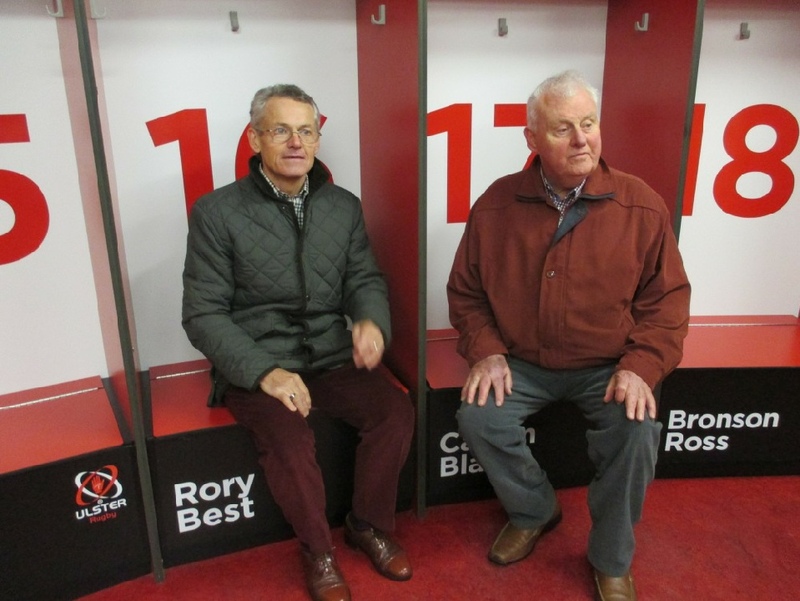 Richard Hodgett and Michael Cousins were on duty elsewhere on the night the picture was taken but all received a small gift of Irish Linen. 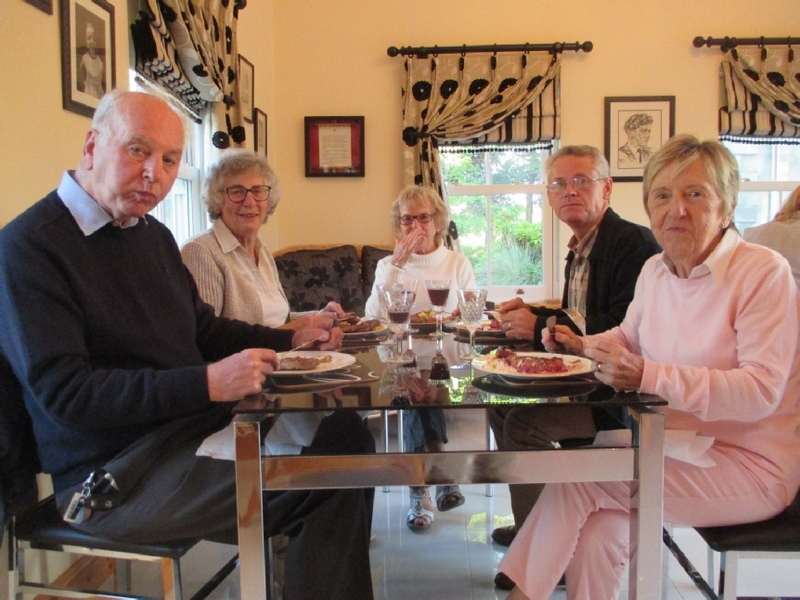 Without a doubt almost every good picture on this website was taken by one of these five at some time or another.